You can park on the street or in our small parking lot along the side of the building. Come in the front door. 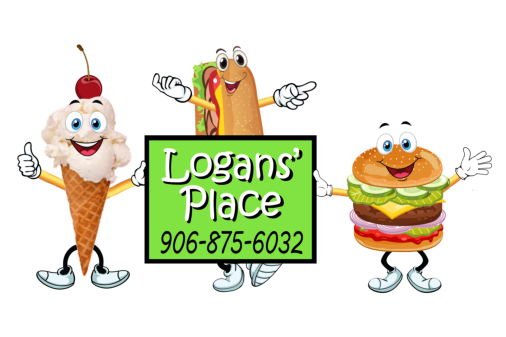 Are you looking to get to Logans’ Place? When you get to Crystal Falls, when you get to the intersection at the 3 way stop, turn to go down the hill. Logans’ Place is ¾ the way down the hill on the left side. On one side is St. Vincent De Paul Store and on the other side is a small parking lot and then a church building. It is a yellow building and on the parking lot side, there is a large mural on the side of the building. You can order ahead of time by calling (906) 875-6032. We will soon have a way to place your order online. Otherwise you can order when you get to Logans’ Place. Just walk up to the counter and look at the menu and place your order. It will be fresh and made to order. Click here for a bigger map and directions using Google Maps. You can order ahead of time by calling (906) 875- 6032. We will soon have a way to place your order online. Otherwise you can order when you get to Logans’ Place. Just walk up to the counter and look at the menu and place your order. It will be fresh and made to order.